DE PEYSTER, ABRAHAM, army officer and office-holder; b. 1753 in New York City, son of James (Jacobus) De Peyster and Sarah Reade; m. 1783 in New York City Catherine Livingston, and they had six children; d. 19 Feb. 1798 at Saint John, New Brunswick. Abraham De Peyster is the loyalist’s loyalist. He fits exactly the popular stereotype, although that image is actually true only of a small minority. He was a member of a wealthy, landed, New York family which had a tradition of office-holding and military service under successive administrations, and which was joined by common interest and marriage to similar families, forming the aristocracy of colonial New York. Abraham and his two younger brothers joined the loyalist side soon after the outbreak of the American revolution. Abraham was commissioned captain in the King’s American Regiment in December 1776, served throughout the war, and saw a good deal of fighting in several states. 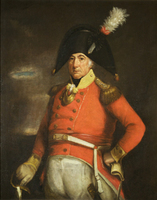 As second in command of the British force at the battle of King’s Mountain (S.C.) on 17 Oct. 1780, he had the unpleasant duty of surrendering after the death of Major Patrick Ferguson. By late 1783 he had been exchanged and had returned to New York. When the city was evacuated by British troops in November, he sailed to Nova Scotia, where he was placed on half pay and granted land in Parrtown (Saint John). Two years later, when the new province of New Brunswick was divided into counties, De Peyster became the first sheriff of Sunbury County. He moved to Maugerville to take up his duties and was granted land across the Saint John River in Burton. 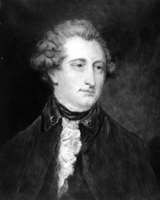 In February 1792 Lieutenant Governor Thomas Carleton* appointed De Peyster treasurer of the province. The treasurer gathered the provincial revenues, chiefly derived from customs duties levied on incoming goods, and disbursed the resulting funds. In addition the position included the responsibilities of the present-day auditor general. It did not, however, carry with it an appointment to the Executive Council. De Peyster returned to Saint John after his appointment not only to be convenient to the customs offices but also to maintain a degree of independence from the legislature in Fredericton, which was probably believed necessary for the successful functioning of the office. Although he was evidently considered a competent treasurer, De Peyster did not occupy the post long; he died in 1798 from “a short and painful disease.” A son seems to have died about the same time, since the cost of their coffins is listed on the same bill. De Peyster appears to have lived with some style in Saint John (there is, for example, a statement of purchase for two slaves in 1797, and among the contents of his estate is a piano valued at £10), but he was found to have died insolvent. Since he left no will, his estate was settled by a series of decrees by the Executive Council. His wife and remaining children returned to New York City after his death. Portraits of Abraham De Peyster are to be found in the works by Draper and Lawrence cited below. N.B. Museum (Saint John), Hazen coll., Ward Chipman papers, bill, 2 March 1798. PANB, RG 2, RS6; RS 8, Appointments and commissions, register of commissions, 1785–1840; RG 10, RS108, Sunbury County. Saint John Regional Library (Saint John, N.B. ), Primary source material, nos.32, 71–73, 93–94, 97–100, 102, 112. Royal Gazette and the New Brunswick Advertiser (Saint John), 20 Feb. 1798. Sabine, Biographical sketches of loyalists, I, 372–73. [A. S. De Peyster], Miscellanies, by an officer, ed. J. W. De Peyster ([2nd ed. ], 2v. in 1, New York, 1888). L. C. Draper, King’s Mountain and its heroes . . . (Cincinnati, Ohio, 1881). J. W. Lawrence, Foot-prints; or incidents in the early history of New Brunswick (Saint John, N. B., 1883), 54, 55, app. Jo-Ann Fellows, “DE PEYSTER, ABRAHAM,” in Dictionary of Canadian Biography, vol. 4, University of Toronto/Université Laval, 2003–, accessed April 26, 2019, http://www.biographi.ca/en/bio/de_peyster_abraham_4E.html.